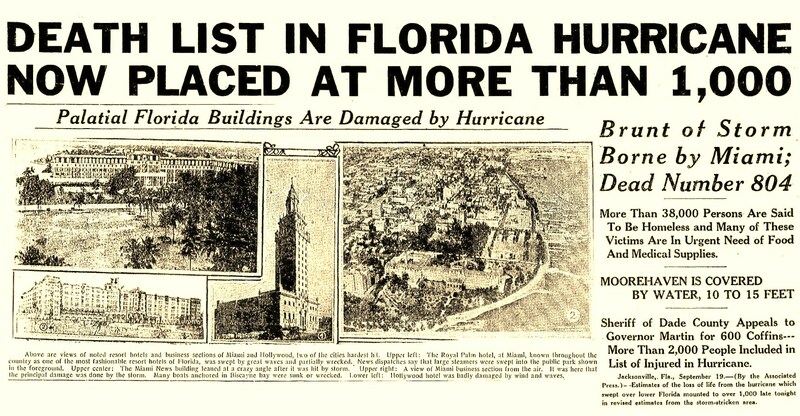 The hurricane that hit south Florida in September of 1926 was one of the worst storms in U.S. history. When the Great Miami Hurricane of 1926 struck, Ray City and Nashville residents were among a number of Georgians caught in the devastation. Pearlie Sutton Conner and four of her children were among the refugees, as well as Oliver Conner, all of Ray City, GA. Nashville residents stranded by the storm included: M.A. Harper and wife; Mrs. H. Giddings and three children; Maude Harper Griner , wife of Arnold Griner; Rachel Hill Griner, wife of Samuel Bryant Griner; Jerome Griner, and Arnold Griner, Jr.
Pearlie Sutton Conner was the wife of James Wilson Conner. Her father was George Washington Sutton and her mother was Julia Ann “Annie” Spell. The 1890 Berrien County, GA Property Tax Digests show that Geo W. Sutton owned 100 acres in Land Lot 510, 10th District valued at $300. The Sutton farm was not far from Ray City, in the Connells Mill District, the 1329 Georgia Militia District. The Suttons took their mail at the Lois community. James Wilson Conner, born on June 22, 1877 in Pulaski County, GA was the son of Daniel Johnson Conner and Nancy Caroline Conner. It is said that his mother died in childbirth and that he was raised by Louisa Conner, who is thought to be a cousin. His father was a Confederate veteran who was wounded in the Civil War. By the census of 1900 Pearlie’s family had moved about 200 miles west of Ray City to the small community of Ponce De Leon, FL situated on on the Florida Panhandle, where her father owned a farm free and clear of mortgage. Pearlie Sutton and James Wilson Conner were married in 1899, and were enumerated in the 1900 census of Holmes County (Ponce de Leon District), FL living on the farm next door to her father’s property. 1900 census enumeration of James W. Conner and family, Ponce de Leon, Holmes County, Florida. Some time before 1920 James and Pearlie had moved their family back to Berrien County, Georgia. They owned a farm on the Nashville Enigma Public Road which James worked on his own account. 1920 census enumeration of James W. Conner and family, 1157 Georgia Militia District near Nashville, Berrien County, Georgia. Within a few years, the Conners moved to Ray City, GA . At least they made their home there by 1926. James Wilson Conner was a member of New Ramah Primitive Baptist Church at Ray City, until dismissed by letter. In 1926 their daughter, Cora Lee Conner, was married to Leamon Andy Godwin. The wedding took place in Fort Lauderdale, FL. So it came to pass that in the very last days of the summer of 1926, Pearlie Sutton Conner and four of her children were in south Florida. It was then, on September 18, 1926 when the Great Miami Hurricane made landfall. Much has been written about The Big Blow of 1926. The population growth of south Florida in the preceding decade had been explosive, fueled by the Florida land boom. The newcomers and tourists had slight experience with hurricanes. The approach of the tropical storm raised little alarm with the public, or with authorities. It was just hours before the storm came on shore that a hurricane warning was finally issued, “But in 1926 there were few avenues for warning people. Only a handful of people owned radios to hear the warnings broadcast on South Florida’s only radio station.” After the storm had passed, the damage was captured on film. A 1926 silent movie newsreel, Miami: The Magic City, documents the extent of the damage and The Sun Sentinel and PBS have informative articles. The Atlanta Constitution headline tolled the death and decimation of the 1926 hurricane. In the aftermath of the storm, the Red Cross and the National Guard assisted with aid to the refugees. When transportation could be arranged, Florida travelers fled the destruction. Many Georgians boarded northbound trains at West Palm Beach, including Pearlie Sutton Conner and her children, and other Berrien County residents. Mr. and Mrs J. R. Bowman and two babies, Winder, Ga; Mrs. R H. Armstrong and five children, Cochran, Ga.; Martha and Gladys Burgamy, Cochran, Ga; Mrs. B. W. Atkinson and baby, Stone Mountain, Ga.; Mrs. C. J. Sutton and two children, Atlanta; Mrs. H. E. Webb, Vidalia, Ga.
Mrs. J. W. Webb, Vidalia, Ga.; Mrs. J. J. Chancellor and two children, Cordele, Ga.; Mrs. J. M. Thornton and one child, Madison, Ga.; Mrs. Beulah Lester, Columbus, Ga.; Mrs. Annie Franklin and three children, Clarksville, Ga.; Mrs. R. C. Davidson and three children, Comer, Ga.; Mrs. J. B. Bivings and two children, Savannah, Ga., Catherine Bivings, Macon, Ga., Lilla, Lula, Lillian and Robert Hudson, Thomasville, Ga.; Mrs. Lincoln Frost and baby, Thomasville, Ga.; Mrs. Reuben Rushing and baby, Thomasville, Ga.; Mrs. E. M. Stokes, Cochran, Ga.
Mrs. S. A. Crews, Waycross, Ga.; Mrs. L.D. Fletcher and three children, Andalusia, Ga.; Mrs. B. H. Thomas and two children, Winder, Ga.; Mr. and Mrs. Jack Hutchinson and son, Atlanta; Mrs. E. W. Cross and daughter, Cordele, Ga.; Mrs. A. L. Pittman, Athens, Ga.; Mrs. R. A. Clyatt and two children, Atlanta; Mrs. Arnold Griner, Mrs. S. B. Griner, Jerome Griner and Arnold Griner, Jr., Nashville, Ga.
Mrs. R. L. Thompson and two children, Winder, Ga.; Mrs. Ruby Hall and six children, Comer, Ga.; Mrs. J. W. Conner and four children, Ray City, Ga.; Oliver Conner, Ray City, Ga.; Mrs. L W. Conder and baby, Columbus, Ga.; Mr. and Mrs. J. D. Daniels and six children, Cochran, Ga; Mrs. R. H. Darnell and four children, Fairmont, Ga.; Mrs. J. W. Ingram, Jr.; and son, Dublin, Ga.; Mrs. A. Roll and two children, Atlanta, Ga; Mrs. W. R. Titshaw and son, Pitts, Ga.; Mrs. H. T. Hosskins and child, Comer, Ga.; Mrs. O. P. Gulibeau, Augusta, Ga.; Mrs. H. G. Harvey and two children, Pelham, Ga; Mrs. J. D. Duvall and daughter, Toccoa, Ga.; Mr. and Mrs. Fred Kramer, Atlanta; Mr. and Mrs. Orris Canatsy and child, Pitts, Ga.; Mrs. J. A. Warren and 10 children, Pitts, Ga.; M. A. Harper and wife, Nashville, Ga.; Mrs. Lillie Titshaw and three children, Pitts, Ga; Mrs. H. Giddings and three children, Nashville, Ga.; Mrs. P. W. Ross, Cordele, Ga.; Mrs. A. C. Wilkens, Cordele, Ga.; Buelah Wilkens, Cordele, Ga; Mrs. R. W. Dowdy and six children, Pitts, Ga.; F. F. Keener and four children, Toccoa, Ga; Mrs. G. G. Sanders and two children, Elberton, Ga.
At home in Georgia, the Conners continued to reside in the Ray City vicinity. In the Census of 1930, they were enumerated in the 1300 Georgia Militia District, to the east of the town, in Lanier County. 1930 census enumeration of James W. Conner and family, 1300 Georgia Militia District, Lanier County, Georgia. The Conners remained in Ray City, thereafter. 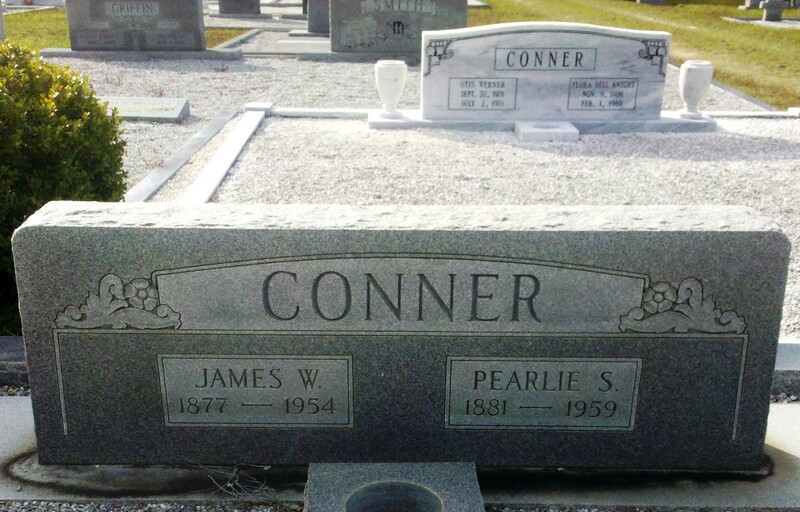 James Wilson Conner died in 1954 and Pearlie Sutton Conner died in 1959. They were buried at New Ramah Church cemetery, at Ray City, GA. Grave marker of Pearlie Sutton and James Wilson Conner, New Ramah Church Cemetery, Ray City, GA.